December 2, 2014 February 10, 2016 ~ Sara W.
Many of us have vivid memories from our youth of Christmas mornings. Growing up, in my home, we first gathered in my parents room for family prayer. Then, once my mom had gone downstairs and turned on all of the lights and sat in the optimal position for picture taking, we were allowed to come downstairs and look at the splendor that had magically arrived overnight. My mom loved to spoil us, particularly on Christmas, so we always came down to a plethora of presents, whether we had the money for it or not. Rumor has it, that on one Christmas, my brothers actually asked if they could take a break from opening gifts since they had so many. In short, we wanted for nothing. As I grew older, Christmases changed. The more I understood about money, the less I expected to see under the tree. But there were some growing pains for a few Christmases between the all-you-can-open Christmas and the it’s-not-just-about-presents Christmas. I’d be lying if I didn’t confess that during my teens, I had longed for the Christmases I had come to expect at a very young age. This provided a conundrum when it came to the Christmases that I provided for our family. Should I give them the all-you-can-open Christmas I had missed during my teenage years? Or do I give them something more, by giving them less? I opted to give them something more on Christmas morning, by giving them less. However, this was not the case during the first Christmases of our marriage. This plan has evolved from other’s examples. I have a friend who gets each of her kids just one gift. I was astonished. She told me that their grandparents get them so much that it would be crazy for she and her husband to buy any more than that. I wasn’t bold enough to limit Christmas morning to one gift per child, but once I heard the idea of getting each child a want, a need, a wear, and a read, I was sold! Thankfully, I heard of this while my eldest was still young enough not to recall those very first Christmases when this rule did not apply. We started this tradition a couple years ago and now my kids know the drill. They can ask for one thing that they want, I usually know of one thing that they need, and one thing to wear, and one thing to read. Of course, I cheat a little, since they believe Santa also brings them one thing. And their stockings are usually filled with some goofy little $1 toy, candy, and a new toothbrush. Why I give a toothbrush for Christmas is beyond me, but it was always in my stocking, so it will be in theirs. I really feel like this helps keep my kids expectations realistic and my checking account in the black. Plus, it helps keep a balance between each child’s gifts. 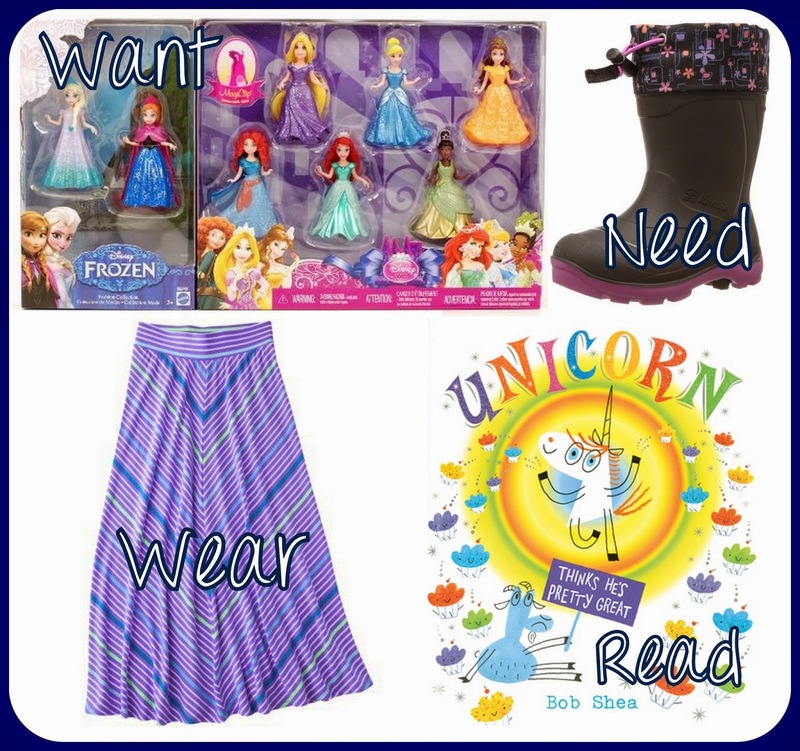 My second oldest has asked for a princess doll set, she stands in need of snow boots, she loves to wear maxi skirts to church, and we all love the book Unicorn Thinks He’s Pretty Great by Bob Shea, so I buy those four and we move on to the next kiddo. It’s a glorious plan that helps my sanity and my pocketbook. Best of all, it’s a tradition that doesn’t over-indulge my children. My hope is that they will always have warm memories of Christmas that will not be based on the amount of presents around the tree, but rather the amount of love shared with friends and family. Good for you!! I’m afraid I’m the over-indulgent grandparent. And I do want to stop.